The Driveway Corner - What's Around Here? Ha! Walking around the first driveway curve is like pulling back the curtain onto a magical landscape of rich and beautiful things - in my imagination, at least! 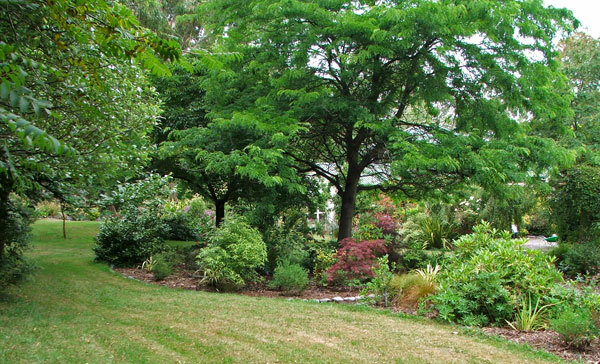 Here are the first lawns and ornamental garden areas. 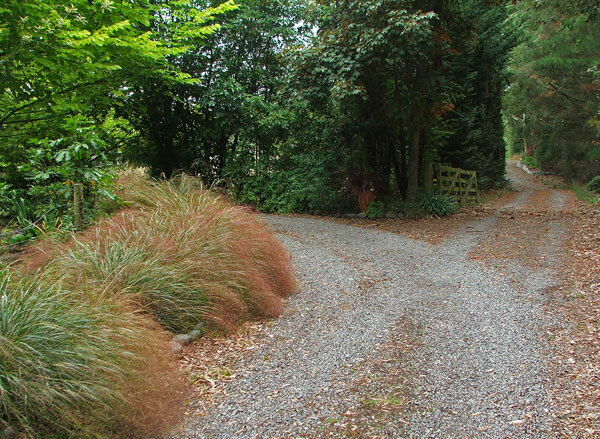 Proper gardens, beautiful colours, lovely specimen trees, feathery grasses - and the first path. I'm wise now about what actually creates a first impression. My last visitor taught me a big lesson - it's not necessarily the plants at the gate, or the obvious things seen on entering the property. It's the first surprise - the first secret that my garden shyly hints at. Back to my visitor - she walked in sedately down the driveway, looking this way and that, politely curious. But, when she turned the corner and saw my first path leading off into the woodland, she immediately danced off down it like a five year old. And to my embarrassment the path was a mess of weeds, as was its destination. And to add insult to injury it was blocked by floppy grasses. There was no way out! Ha! So now I know - that first path will often be my first impression creator. 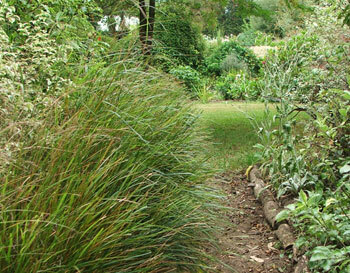 So it's well raked and edged, overhanging Pittosporums have been trimmed, and its garden has been carefully weeded. I'm adding more and more texture plants and small shrubs along the garden's edge. Everything is very green. And there is a way out - after all, no forest is ever magical if one gets stuck in it. 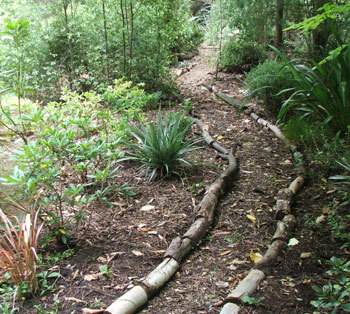 An item of quirky interest lies waiting at the path's far corner, a natural and delightful destination. 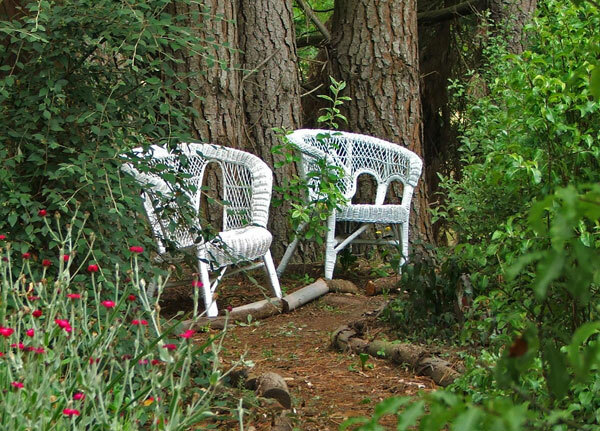 Two white cane chairs lean rather incongruously against some rough pine tree trunks, looking as if they've escaped from the confines of the conservatory. They're both bargains I rescued from the Charity Shop. And oh so comfortable - even without cushions. 'Sit with us', they whisper, 'Sit with us awhile and enjoy the freedom of this fairy forest'. Well, that's what I'd like to think they say. See what you think! The path continues past well-clipped foliage and tips the visitor out onto the Driveway lawn. Such sheltered beauty! What a delightfully shaped lawn! What lovely shrubs - and look at that beautiful Golden Elm. A purple Cotinus - what a wonderful contrast! Oh look - there's more - over there!